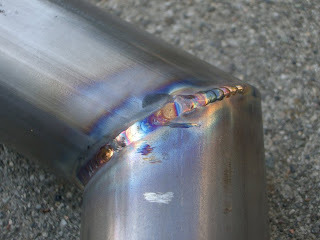 * Keep the weld bead width as thin as possible. This is really key to everything else, and making a thin weld bead will force the welder to do everything else correctly (ie keep the current to a minimum, keep the electrode close to the surface, etc). 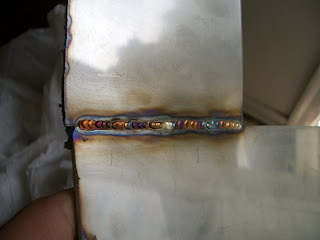 * Minimize the heat input to the work by any means necessary: Lower the amperage, bring the electrode closer to the surface, use copper chill blocks, stitch-weld 1" sections and allow the work to cool between welds. *Keep the tungsten electrode sharpened to a needle-point. The length of the taper should cover about 2.5 times the electrode diameter, and I normally leave the tip fully sharp for low-amperage welding. I've never had a problem with the tip breaking, and it helps direct the arc. * The part fit-up must be superb. I always try to tell myself "sure, I can fill that gap", but no. With stainless, filling the gap means dripping lots of filler rod, which will be very hot and leave the weld in very bad condition. The excessive heat will "burn" the chromium out of the alloy. * The electrode should be as close to the surface as possible. This is not an exaggeration. I mean really get the electrode as close as you can without touching the puddle. A small, hot arc is much more effective than a large cool arc. * Use thin filler rod. 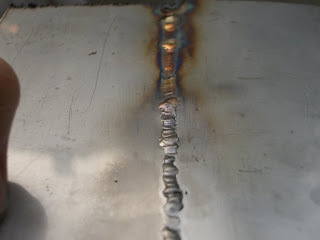 If you're welding 1/16" thick stainless, I'd say the weld bead should be 1/8" wide or less. This will be a problem to weld with 1/16" rod, because it is difficult to dispense a small enough amount of rod to keep the bead thin enough. Additionally, since the electrode is being held very close to the surface, there isn't much room to stick the rod into the puddle. Using .045" and .035" rod is a HUGE help. * Don't let the arc melt the rod! 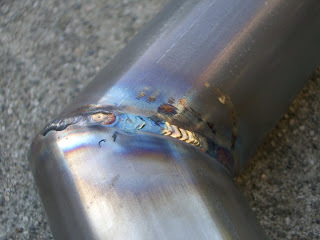 When adding rod, move the torch backward a tiny bit so that you can dip the rod into the puddle, then pull the rod out of the puddle, and advance both of your hands forward in the weld direction. I can tell that I've messed up when I see the rod form a ball on the end, and the arc changes color. If the weld is important, I would cut the end off the rod and start again. Dark blue, purple, turquoise = Borderline OK. Acceptable for some situations. 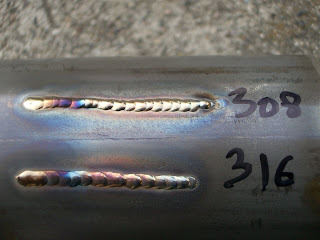 * The most common fill rod for welding stainless is 308. As near as I can tell, 308 can be used on anything, but it would be unwise to use it on higher grades of stainless like 316. I tried both 308 and 316 fill rods on 304 base metal. They behave pretty similarly, but 308 seems to melt a little more easily. * Most rods and base metals can be obtained with an "L" designation, like 304L or 308L. These are low-carbon alloys and are preferable over the non-L alloys because welding can cause carbon to precipitate in the metal. The upshot is that welding 304 will have a more deleterious effect on its corrosion resistance than welding 304L. How important is this effect? I don't know. All of the information that I found on the net was purely anecdotal and poorly documented. This was attempted with 1/16" filler. Very inconsistent bead width. This was done with .045" filler. It's not perfect, but much better. 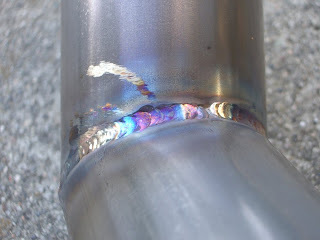 Both welds were stitch-welded in 1" sections. Very nice photos! I feel like I'm there.